Situated in Dalt Vila, exactly in the Cathedral square, the Archaeological Museum exhibits historical remains of Ibiza and Formentera from the first settlers to the Catalan conquest in the XIII century, covering a period of over three thousand years. 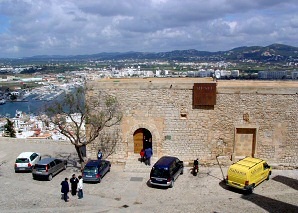 The installations of the Museum occupy the ancient Salvador chapel, the old University building, an institution with its own government of the island until its abolition by Felipe V in the XVIII century; and the inside of the Santa Tecla bulwark, a construction that forms part of the fortified enclosure of Dalt Vila. The material that the Museum contains proceeds principally from the Phoenician settlement of sa Caleta, from Dalt Vila, from the cemetery of Puig des Molins and from the numerous prehistoric Phoenician, Punic, Roman and Arab sites of the Pitiüsan Islands. The exhibition has six sections: Prehistory, Phoenician Colonisation, Punic era, higher Roman imperial era, lesser Roman imperial and latter ancient era, and the medieval Arab era. The visit facilitates access to the Santa Tecla bulwark where there is a spectacular panoramic vies over the bay of Ibiza. 2,40 euros. Free for minors.